The AquaCount eliminates the use of headphones and stopwatches by counting revolutions and calculating discharge velocity. The AquaCount is a lower cost alternative to the AquaCalc for those who do not require total stream flow discharge calculation or electronic storage of measurements. Compatible with Price-type AA and Pygmy current meters. Displays revolutions, elapsed time, and velocity as it measures. 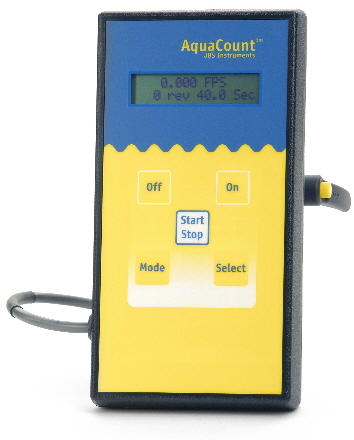 The AquaCount, a velocity computer for use with mechanical current meters.